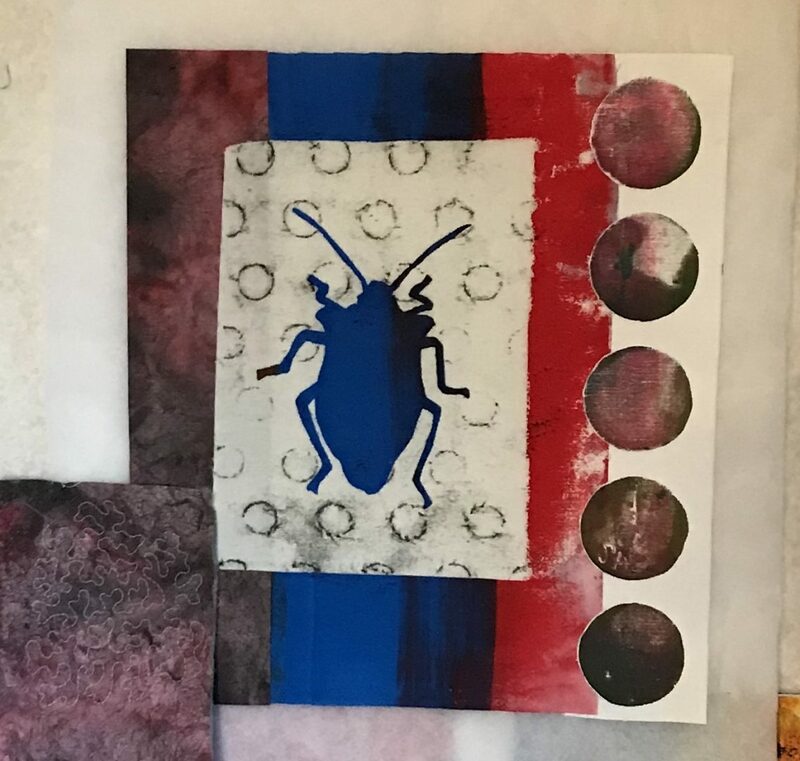 Screenprinting with homemade stencil of a Stink bug. 😋 Shall I dare to quilt it with white thread straight over all the colors (except over the bug). See the test bit. Thank you for your point of view. Have you only made one print so far? It's always a good idea to run off several prints so you can try different colours and patterns of stitching on each one. White quilting on the white centre panel will be almost invisible but if you take the white stitching out over the borders it will be very noticeable. If you are feeling brave you could quilt all of the details of the bug in a pale colour so that they show clearly. If it were my work I'd introduce some red stitching too - it'll help connect the red of the 'frame' to the rest of the piece. On that occasion I made a lot of other motifs, several pumpkins, hearts and birds, but only one bug. I don’t remember why I will consumer the Paul details on the bug. Intresting! Where can you stitch the red part, did you mean. I havn’t thought of that. That was a new idea. Thanks for that! Sorry about the autocorrect above! It should be: I don’t remember why. I will consider the red details on the bug.